So I thought I would take a look at Corinth's standings in the C Spire Fiber to the Home(FTTH) race this morning (1-30-2014) and what do I find? North Corinth is at 7%, central Corinth is at 2% and south Corinth is at 1%. To say that I was disappointed by these numbers is putting it lightly. I was really expecting my fellow Corinthians to show C Spire that we truly did want change. I know that each of us have different priorities in our day to day lives and I surely do not expect my fellow citizens to let me tell them where or how to spend their money. I was and still am, very optimistic about Corinth's future with FTTH and the business offerings that C Spire already offers in our area. So where exactly do we stack up in this race for getting fiber to the home? That's where we stand, basically. 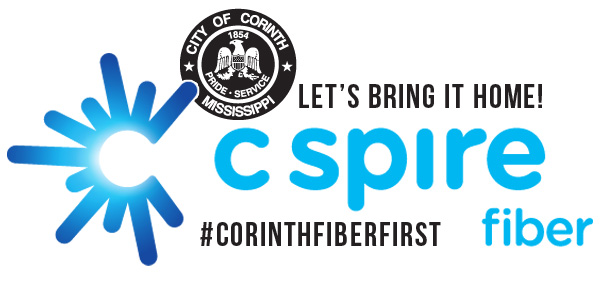 Looks pretty bleak for Corinth being the first with fiber to the home in the great state of Mississippi, huh? So we must ask ourselves the simple question, “Why?”. Just from the number of people that I get to talk to on a daily basis, through my day job, I think residents just haven’t taken the time to look at the information pertaining to how FTTH will and can affect them. They have not looked into how this technology will profoundly change our town for the better. I hope the people of Corinth realize that there is a lot more at stake here than downloading movies from Netflix faster. I hope that the people of Corinth realize that we live in a new economy, where any technological edge that you can have, matters. Moving forward, we need every tool available to attract the jobs we need to grow our town. We need these tools so that we can reach our children in so many new ways. Such as new distance learning programs or real computer science classes. And just as importantly, (and the answer to the biggest complaint I hear) we need this technology to stand out in the recruitment of new industry. I truly believe in a matter of a few days Corinth could rise well above Horn Lake on the leaderboards and meet the C Spire percentage goal to be FIRST in one of our three fiberhoods. The positive press Corinth would receive would be unprecedented and industries would take notice of our progressive approach. The tools have been provided to us as a community. What we choose to do with them is yet to be seen. If you have not already heard that Corinth could be getting fiber pretty soon, either you live under a rock or not in Corinth. Heck, you probably don’t even leave in Mississippi! But all that aside, yes… we will be getting fiber early next year and I am very excited about that! Why? And what is this fiber that you speak of? Well... I am not the type of person that can just wax poetic about things and make them simple short and sweet, but bear with me and let me just explain a little. So let's start with this thing called "fiber". And no, we are not talking about a really awful tasting granola bar or something you put in a beverage. The word "fiber" is used as a short name for "fiber optic cable", which is a strand of extruded glass or plastic that light can pass through. Ever see those really cheesy Christmas trees that have really flexible, small and clear hairs sticking out of it that change colors? That is a fiber optic cable. This is a phrase that you will hear a lot bounced around a lot. This just means that the fiber optic cable is actually run right up to the side of your house. See, most ISP's (Internet Service Providers) already use fiber optics to transport their services throughout a region or city. An example might be in order. Let’s say you’re a current AT&T U-verse customer. That service is delivered to your home using fiber optics, but only to a point. U-verse utilizes what is called a "Fiber to the Node" platform. uverse-services-wiki. This means that the fiber stops at a certain point before reaching your home. This also means that even though it might be transmitting at 1Gbps up to that point, it is cannot transmit at that rate all the way to your home because the cable used to carry that signal changes. At the point of the node, the signal is then transferred to a metallic cable, which is in no way capable of transmitting at the speeds comparable to fiber. For clarity, U-verse is not marketed in such a way that it claims to give you 1Gbps to your home. Their top service clearly offers a max download speed of 24Mbps. So I am not knocking U-verse in anyway. I am just using it as an example to compare the two services. 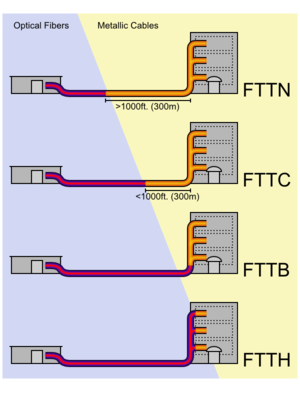 To better illustrate the difference between "Fiber to the Node"(AT&T U-Verse) and "Fiber to the Home"(Cspire, Google-Fiber), I found this nice image over on Wikipedia to be very helpful. You can clearly see the difference in the two networks. See where the representation of the cable turns orange on the FTTN as compared to the FTTH? For every foot that line is orange, the signal gets weaker and weaker. From this you see there is less copper cable(mainly the cable in your home) in a FTTH network than a FTTN network. And because of this, FTTH is far in a way better in delivering the services we all want and need. Why should I care about all this? This video touches on just about every topic that hits close to home for me. Sure, I could have a long list of selfish reasons to want FTTH at my house. To be completely honest, where I live is actually not even on the current maps for the areas that can currently sign up. But for me, it's not about just my experience with technology at my home. It's about the future of this great city. Taking this technology and using it to move our great city forward. Not just keeping the great companies we have here, but attracting new ones to our area. Better than that, allowing someone that already lives here to pursue an idea and start their own company. Allowing a child in one of our schools to be introduced to an actual Computer Science curriculum in middle school. And I am not talking about the rinky dink "Computer Discovery" classes that our kids are exposed to now. Corinth has a lot of smart, creative and innovative thinkers. With a strong fiber based infrastructure as the backbone to our area, this technology will take away barriers that are currently keeping us stagnate. It will open up doors that we never could have imagined now. What is good enough today, will be useless tomorrow. Settling on what we have now and telling ourselves that it's good enough is... well... too put it bluntly is a cop out! We have to stop being scared of technology, just because we don't understand it. Stop looking at the internet as a thing that only bad stuff comes from or where bad things happen and see it as the true tool that it is. And it is just that, a tool. Just one of the tools in our belt. I firmly believe that if you combine this tool (FTTH) with our people, awesome things will happen. No, not overnight. But they will happen. So go sign up already! To sign up, all you have to do is head over to the CSpire Sign-Up Page for the city of Corinth. Click on the area of the map that you live in and fill out the form. Yes, there is a $10 deposit that you have to pay, but come on. Hasn't someone bought you lunch before and you never got a chance to pay them back? I bet it has. So call it good karama or whatever you like. That $10 dollars will be substracted from your first bill, so... there ya go! Also, remember that if you sign up during this pre-registration period, there will be no or very little installation fees. Come on! You cannot beat that with a fiber optic cable! Any comments? Until I get a comment system running here... hit me up on Twitter @unisys12 or Google+ +Phillip Jackson. Would love to chat more about all this. Exceptional productivity now fits perfectly in any workspace. The Savin MP C300/MP C300SR Color Digital Imaging System offers true multifunctional versatility, advanced workflow capabilities and astonishing speed—all in an amazingly compact system. The smart, sleek design includes tools and capabilities that maximize efficiency and ensure low total cost of ownership. Multiple security features provide strong lines of defense for documents and data. It’s the ideal solution for smaller workgroups.